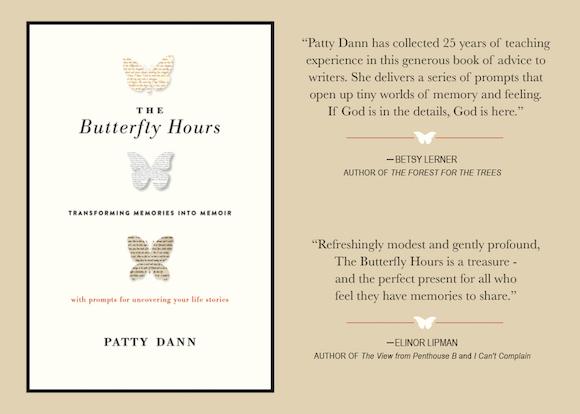 Patty Dann is the author of three novels: Starfish, Mermaids, and Sweet & Crazy. She has also published two memoirs, The Goldfish Went on Vacation: A Memoir of Loss (and Learning to Tell the Truth about It) and The Baby Boat: A Memoir of Adoption. Her work has been translated into French, German, Italian, Portuguese, Dutch, Chinese, Korean, and Japanese. Mermaids was made into a movie starring Cher, Winona Ryder, and Christina Ricci. Her articles have appeared in the New York Times, Chicago Tribune, Boston Globe, Philadelphia Inquirer, Christian Science Monitor, O, the Oprah Magazine, the Oregon Quarterly; Redbook, More, ForbesWoman; Poets & Writers Magazine, Writer’s Handbook, Dirt: Quirks, Habits; and Passions of Keeping House, and This I Believe: On Motherhood.